My sister asked me to help her with her homework for mathematics, however frustratingly I was not able to figure out how to solve it. The assignment is as follows where it was requested to calculate the length between G and I. How should this assignment be solved? 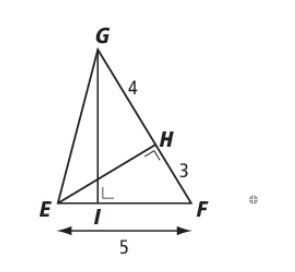 It is a messy plane geometry and algebra problem. All the following using Pythagorean theorem. First $|H-E|=4$, then $|E-G|^2=32$. Let $x=|E-I|$ and $h=|G-I|$. The equation for $x$ and $h$ are $x^2+h^2=32$ and $(5-x)^2+h^2=49$. Solving these equations gives $x=.8$ and $h=5.6$, where $h$ is the answer to the problem. Is there a way to solve for pythagorean triples with one side length equalling 1?